Birmingham Fastener has won the Global Business Transformation award in the second annual Epicor Customer Excellence Global Awards program. Criteria used to evaluate nominations included customer, employee and business impact, process improvements, and positive changes gained within the organization to demonstrate benefits and impact of the technology on the customers’ business. Project complexity, business objectives, and results achieved were also weighed in the final decisions. As a manufacturer and distributor of T-head bolts, anchor bolts, cross brace rods and structural and non-structural components for the metal building, steel construction, energy, utilities, aerospace, OEM and industrial markets, The Birmingham Fastener Group of Companies includes 8 regional operations located throughout the country. Birmingham Fastener has been honored with the Business Transformation award in the 2017 Epicor Customer Excellence Awards program for the Americas region. Recipients were selected by Epicor Software Corporation based on the complexity of the project, clearly stated objectives and overall business impact of the initiative relative to stated goals of customers that have successfully implemented the Epicor solutions. Being recognized by Epicor for our efforts to improve our distribution operation is a great achievement for the entire team at Birmingham Fastener. I am very proud of everyone for putting forth so much effort that is helping us continue to deliver value to our customers.” – Andrew Podner, Chief Operations Officer, Birmingham Fastener. 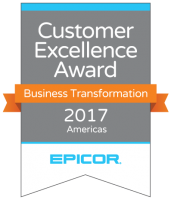 The 2017 Epicor Customer Excellence Awards winners in the Americas regional program were presented at the Annual Insights Customer Conference held in Nashville, Tennessee. · Rapid Time to Value for customers who have experienced fast implementation and deployment through motivated project teams, efficient and effective staffing, training and production readiness. Regional program winners automatically considered as finalists in the global categories for overall “Customer of the Year” in the Global Awards. For more information on this program, send e-mail to ExcellenceAwards@epicor.com. Epicor and the Epicor logo are trademarks of Epicor Software Corporation, registered in the United States and other countries. Other trademarks referenced are the property of their respective owners. The product and service offerings depicted in this document are produced by Birmingham Fastener and/or Epicor Software Corporation.